RUSH: So this is funny. So Trump has finally selected Larry Kudlow to become chairman of the national Council of Economic advisers. He’s replacing Gary Cohn, who was too much a globalist and was asked to go back to Goldman Sachs or somewhere. So CNN is announcing this by saying, “Trump Taps TV Personality as New Economic Adviser.” Hee-hee-hee-hee-hee. Now, for those of you that don’t know, Larry Kudlow is a veteran of the markets. Larry Kudlow was a star at Bear Stearns, and he was heavily involved in policymaking in the Reagan years. He’s been around a long, long time, and I must… For those of you who have been around long enough, this goes back to the early nineties. 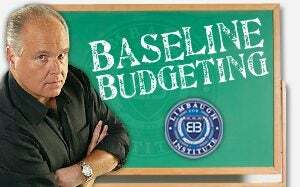 If you’ve been here long enough that you remember my detailed explanation of baseline budgeting and how it works, it was Larry Kudlow who explained it to me one night in New York over dinner, and, until that time, I had no idea what baseline budgeting even was. I didn’t even know it existed. I thought the federal budget was like any other budget. You figure out what you spent. Do you need that much or more the next year? If you didn’t spend as much as was allocated, you cut the budget the next year. I found out it doesn’t work that way at all, that the current services baseline, whatever is spent in a given year, becomes the baseline upon which guaranteed increases happen every year. And the more you can add to the current services baseline — like Obama’s stimulus package added to the current services baseline — it’s how the budget never gets cut. It’s enacted into law that the budget must grow minimum 5 to 7% every year no matter if you do nothing, and Kudlow spent an hour explaining this to me. He is no slouch, and CNN’s trying to put him down by writing (laughing), “Trump Taps TV Personality as New Economic Adviser.” For crying out loud, you know, Tim Russert used to work for a member of Congress. All these guys in media have worked for members of Congress or senator. Chris Matthews was the chief of staff to Thomas P. “Tip” O’Neill Jr. when he was Speaker of the House. But now Trump is tapping a “TV personality.” It’s supposed to be an insult to Kudlow. The one interesting thing is that Kudlow came out against Trump’s tariffs when he announced them, and that’s in line with what Kudlow’s ideological economic beliefs are. But he’s a good guy. He’s been on CNBC for quite a while. But he spent a lot of time in the gutter, in the economics gutter. He spent a lot of time in the economics real world, and has that experience. And why should being on TV be a disqualifier? Does that mean we shouldn’t be watching anybody on TV who is an economics reporter because they’re just a “TV personality” and we therefore really shouldn’t be listening in? So CNN, you throwing Christine Romans under the bus? She’s your economics reporter. “Trump taps TV personality…” Hey, it’s better than tapping somebody from the swamp.